The Wild Card round kicks off the NFL Playoffs every year, and seemingly always brings with it some interesting matchups. This year is no different as the Wild Card round holds several intriguing individual player matchups like the battle’s between our All-Pros while another contest pits two teams together for the third time this season. Before the opening round of this year’s NFL Playoffs begin, PFF Analyst Mark Chichester breaks down interesting facts that Pro Football Focus has obtained about each team who will be in action over the weekend. Team Stat: The Tennessee Titans’ defense allowed just 23 big-plays throughout the regular season, which was the fewest allowed by any defensive unit in the league. 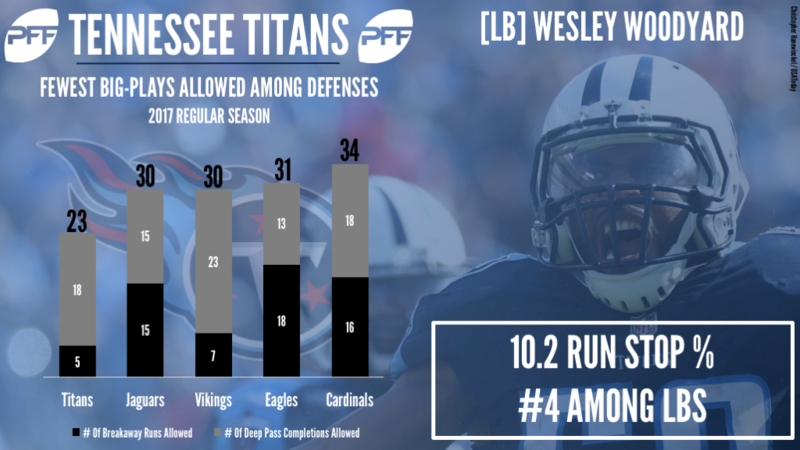 Key PFF Elite Stat: Inside linebacker Wesley Woodyard produced a run-stop percentage of 10.2 percent this season, which was the fourth-best mark among inside linebackers with at least 225 run-defense snaps. The Titans, who allowed just 18 deep pass (passes of 20 or more yards downfield) completions and just five breakaway runs (runs of 15 or more yards) all season, will need to keep this up if they’re to contain an explosive Chiefs offense that is packed with big-play threats. Over the course of the campaign, veteran linebacker Woodyard was certainly a key cog in preventing such big plays, and through 17 weeks, Woodyard racked up an impressive 37 run-stops, the fifth-most among the league’s inside linebackers. 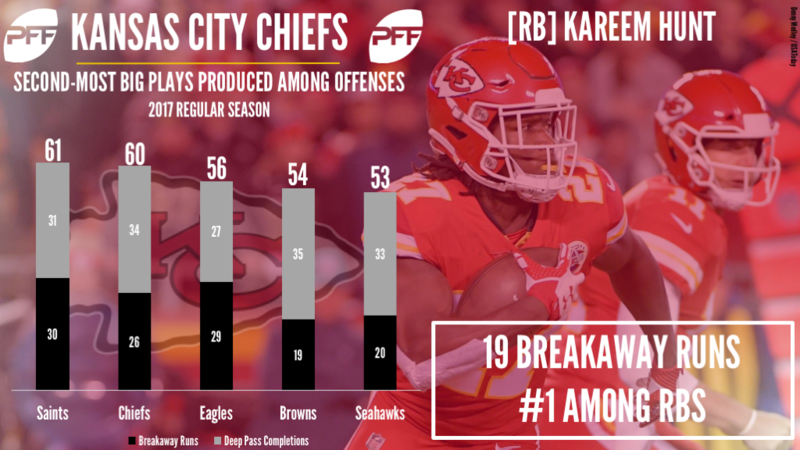 Team Stat: The Kansas City Chiefs’ offense racked up 60 big-plays throughout the regular season, which was the second-most among the league’s offenses. Key PFF Elite Stat: Running back Kareem Hunt has accumulated 521 rushing yards on 19 runs of 15 or more yards, which ranks first among running backs. This year, the Chiefs have rocketed to the top of the big-play leaderboard with a rejuvenated Alex Smith at the helm of the offense. Through 17 weeks, Smith completed 33 deep passes, which was tied for the most among quarterbacks this year and breakout rookie running back Hunt added a further 19 big plays from runs of 15 or more yards. All told, the team racked up 60 big-plays which was second only the New Orleans Saints. This weekend, the battle between the explosive Chiefs offense and the stout Titans defense will arguably be one of the most intriguing contests of the season. Team Stat: This season, the Falcons’ offense converted 44.8 percent of their third down attempts into either a first down or a touchdown, which was the highest rate among the NFL’s offenses. Key PFF Elite Stat: Through 17 weeks, running back Devonta Freeman forced 36 missed tackles on his rush attempts, which was the ninth-most among running backs. 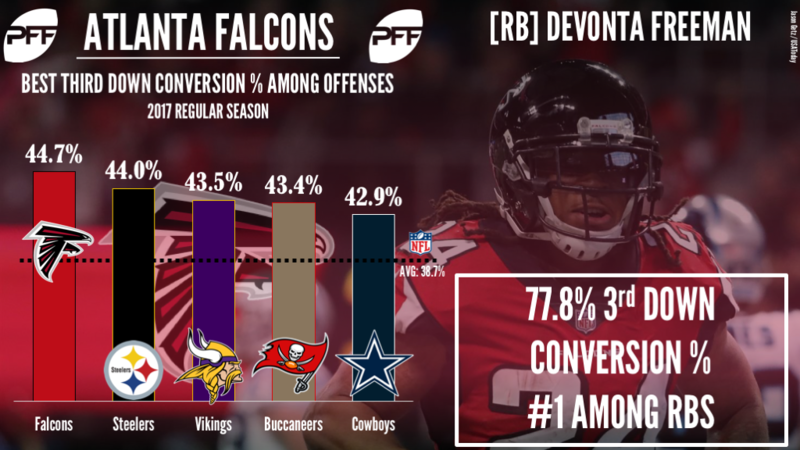 While the Falcons haven’t quite managed to replicate the same offensive success that they found a season ago, the team is still laden with elite talent and this has made them one of the most effective third down teams in the league. Through 17 weeks of the regular season, 77.1 percent of quarterback Matt Ryan’s third down passes were deemed ‘catchable’, which was the fourth-best mark among quarterbacks with at least 100 third down attempts. On the downs where Ryan wasn’t asked to throw, Freeman converted 77.8 percent of all his third down carries into either a first down or touchdown, which was the best mark among all running backs with at least 10 third down carries. 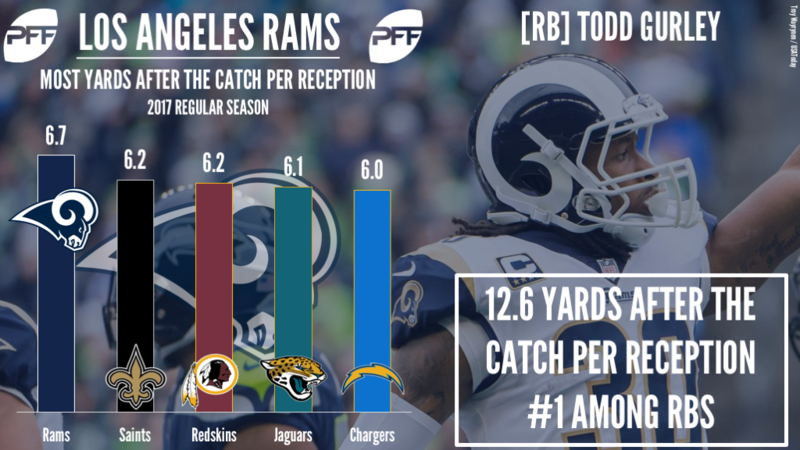 Team Stat: The Rams’ offense averaged 6.7 yards after the catch per reception this season, the best mark among all the league’s attacks. Key PFF Elite Stat: Through 17 weeks, running back Todd Gurley averaged 2.15 yards per pass route run, which ranked second among running backs with at least 25 targets this season. The Rams’ offense has executed at a high level this season and the unit is night and day compared to last year’s group. This season, new head coach Sean McVay has game-planned to get the ball into the hands of his talented playmakers, who have done a tremendous job of generating yards after the catch. No Ram has been better at this than Gurley, who has averaged 12.6 yards after the catch per reception this year, the best mark among running backs with at least 25 targets. 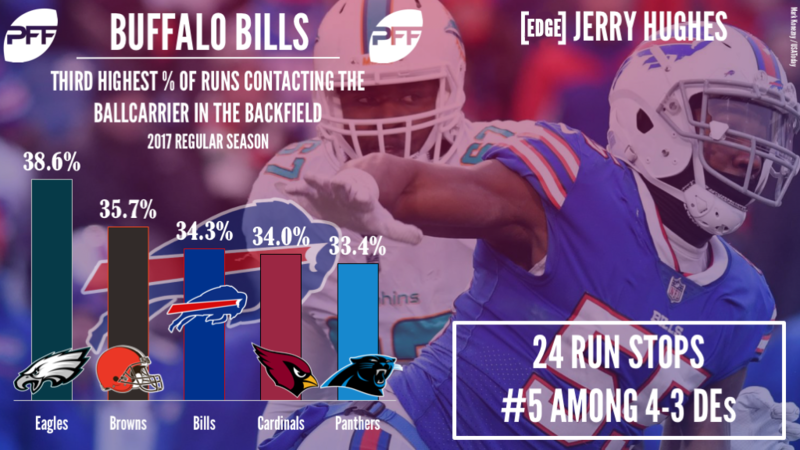 Team Stat: Bills defenders contacted the opposing running back in the backfield on 34.3 percent of their run defense snaps this year, which was the third-best rate among defenses. Key PFF Elite Stat: Edge defender Jerry Hughes racked up 24 run-stops throughout the 2017 regular season, which was tied for the fifth-most among 4-3 defensive ends. Aided by a front seven that’s stacked with youth, the Bills’ defense contacted opposing running backs in their backfield a total of 160 times over the last 17 weeks, which is the second-most among all defenses this year and all told, they’ve managed to generate a backfield hit once every three running plays. Veteran defensive end Hughes has been key to helping the team achieve this, as he’s easily been the Bills best run defender this year. Through 17 weeks, Hughes’ run defense grade of 89.2 is good for eighth among all edge defenders, and his 24 run-stops are good for the fifth-most among players at the position. 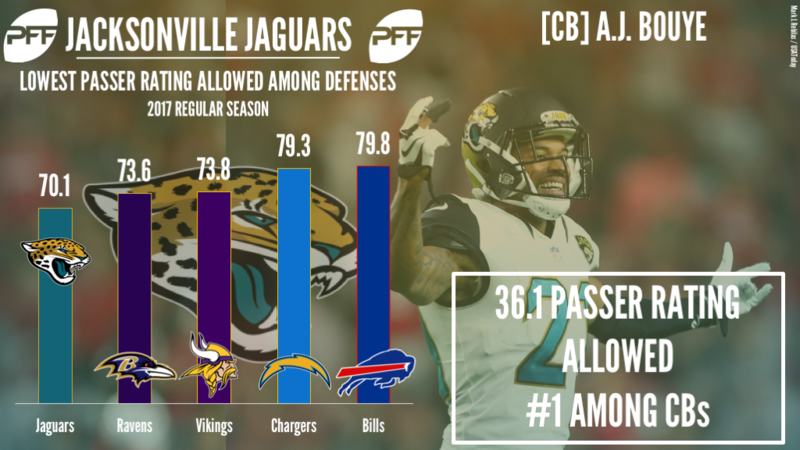 Team Stat: The Jaguars’ defense has allowed a passer rating of just 70.1 on their pass defense snaps this year, which is the best mark among all defenses in the NFL. Key PFF Elite Stat: Through 17 weeks, cornerback A.J. Bouye allowed a passer rating of just 36.1, which was the best mark among cornerbacks this year and the lowest rating ever recorded by an outside cornerback in the PFF era (2006-present). Through 17 weeks of the regular season, no team has been stingier in coverage than the Jacksonville Jaguars, who collectively allowed a passer rating of 70.1 and a completion percentage of 56.8 percent, both of which are the best marks among defenses this year. Bouye has been an integral part of that success, as he’s allowed a record-setting 36.1 passer rating on the throws into his coverage this year. Team Stat: The Carolina Panthers blitzed on 44.4 percent of their pass defense snaps this year, the second-highest rate in the NFL. Key PFF Elite Stat: This season, linebacker Shaq Thompson ranked third among 4-3 outside linebackers with a pass-rush productivity of 17.7. 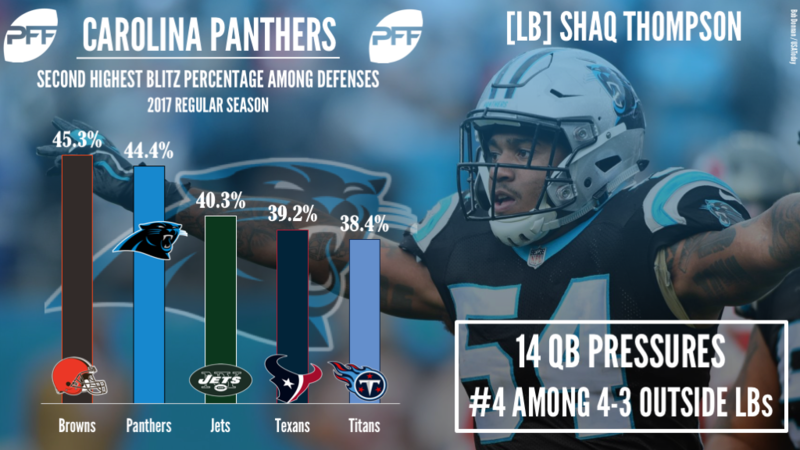 The Panthers’ defense pulled no punches in 2017 and sent more blitzes (281) than any other team in the league. Third-year linebacker Thompson was a key part of his team’s effectiveness on the blitz, ending the season with 14 total quarterback pressures from 62 pass-rushing snaps, the fourth-most among 4-3 outside linebackers. Team Stat: The New Orleans offense targeted running backs on 32.7 percent of pass attempts this year, which was the highest rate among the league’s offenses. 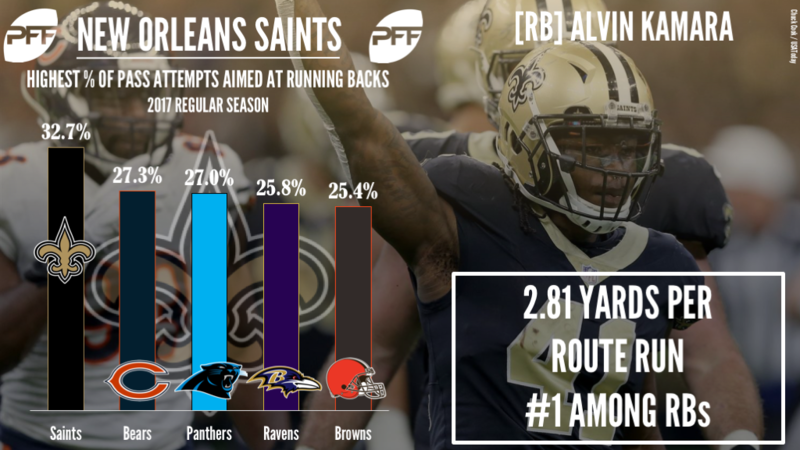 Key PFF Elite Stat: Running back Alvin Kamara averaged 2.81 yards per route run this season, the best mark among all running backs in the NFL. Early in the season, the New Orleans Saints quickly discovered that they had two game-changing playmakers in Mark Ingram and Kamara, and they adjusted the offense to get them the ball as much as possible. Throughout the year, a staggering 163-of-498 pass attempts were sent to their running backs, which was the most among the league’s offenses. Kamara took his opportunity and set forth on an astonishing rookie campaign in which he racked up 826 receiving yards at an average of 2.81 yards per route run, the best mark ever recorded by a rookie in the PFF era.